Make sure they’re holding the camera level and steady (elbows tucked in, holding it in both hands, leaning against something if they can). Remind them to keep things simple by filling the frame with their subject as much as possible, to reduce distracting elements. Get them used to checking what’s in the frame before they press the shutter, so they can avoid the usual beginner error of trees growing out of people’s heads. Encourage them to shoot with the camera on its side as well as in landscape mode, for vertical shots that are great for portraits, trees and buildings (and giraffes). Back in the day when we had to buy film and processing was expensive, the tendency was to hold back on shooting. These digital days, that’s no longer an issue, and it’s great news for learners of all ages, as they can shoot away and see their results immediately, so their learning curve can be a lot quicker. So foster your children’s natural inclination to play and take lots of pictures, and review their images with enthusiasm, concentrating on what they’ve done well rather than on what hasn’t worked. While they’ll probably enjoy shooting at wild angles – which can be fun with candids and pets – introducing them to the ‘rule’ of thirds will really give their images a boost. And of course, once they’re familiar with it, they’ll equally enjoy breaking it! Even if they don’t quite get it, simply teaching them to position their subject off-centre is a great start – and that means showing them how to use focus lock to ensure their off-centre subject is sharp. It’s such a simple technique that works with all types of camera, but it will make a world of difference to their imaging. Show them how and when to select their camera’s different scene modes, such as portrait, sports and night-time, and explain what the camera is doing when it uses these settings – changing the aperture, the shutter speed, the ISO and so on. This will help them start to understand how cameras work, and set them up well for exploring more advanced settings like aperture priority and manual. 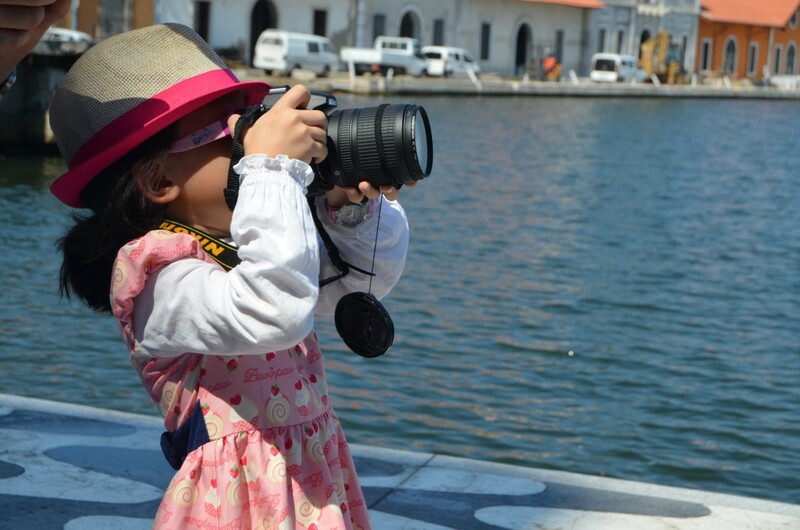 If your child is using a DSLR (or a compact with advanced exposure modes), start them off in ‘auto’ and with scene modes so they don’t have to worry about settings. When they’re getting to grips with composition, introduce them to aperture priority or shutter priority, and you can use these to show them how aperture, shutter speed and ISO are all interlinked, and how changing any of these affects the final photograph. Finally, while the temptation might be to micromanage their early efforts, the most important thing you can do is to let them play with their camera. Don’t stifle their natural curiosity and inventiveness – you never know, their unfettered imaginations might teach you a thing or two!